Overhauls the audio of the Radgulls and Radcrows while adding independent volume sliders. New crow and gull call and distress sounds. Gulls and crows will now keep silent at night and in bad weather. Made using xEdit, Creation Kit and Audacity. 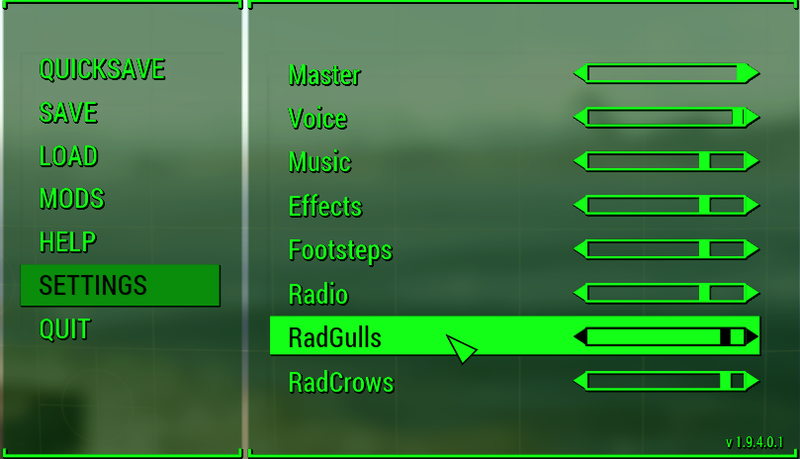 A simple mod that overhauls the audio of the radGulls and radCrows. 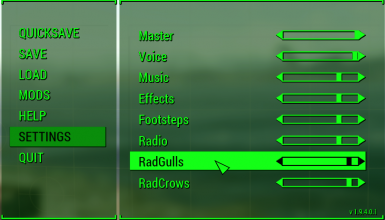 - separate volume sliders for radCrows and radGulls. - added conditions so radGulls and radCrows will be quiet at night and during bad weather. - vanilla radGull and radCrow sounds replaced with real bird calls. - sound attenuation range has been increased a little but not too much. - Not compatible with Radiant Birds. Please remove that mod completely and delete folders "data/sound/fx/npc/radgull" and "data/sound/fx/npc/crow". - Note that F4SE v0.3.0 (and possibly other versions) appears to have a bug where it won't always save your volume slider settings, particularly if you have more than about 9 or 10 volume sliders in total. This problem is absent when not using F4SE.